Becca Thorne Illustration: Follow My Travels on Tumblr! Follow My Travels on Tumblr! If you follow me on Facebook or Twitter you probably already know that I'm travelling in mainland Europe through August and September. Since my last post we've moved out of Leicester, put all our stuff into storage in my parent's barn, bought ourselves a 13 year old Polo and driven it from the UK to Italy over a period of seven days. Our first stop was Belgium, where we camped in Blankenberge and spent a day wandering around gorgeous Bruges (and sampling the waffles mit kirche) before heading into the German alps for some fossil hunting, fossil museums and camping in the pretty medieval town of Pappenheim. From there we drove into the unbelievably beautiful Swiss town of Lucerne where we camped for the night and then headed into Italy the slow way, via numerous mountain passes, partly to avoid paying the motorway vignette but also because it was much more fun! We're currently staying in the little mountain hamlet of Moglietta, above the town of Amandola, in Italy's stunning Monti Sibillini National Park. We're here for the next couple of weeks, so I'm making the most of the wifi access today and have been posting some of the photos of our travels so far! You can check out my travel blog at becca-thorne.tumblr.com and follow me there if you want to see (hopefully) more regular photographic updates of what I'm up to and where I've been, as well as pages from my sketchbook and other gubbins. In the meantime (because this is what the internet's for, no?) 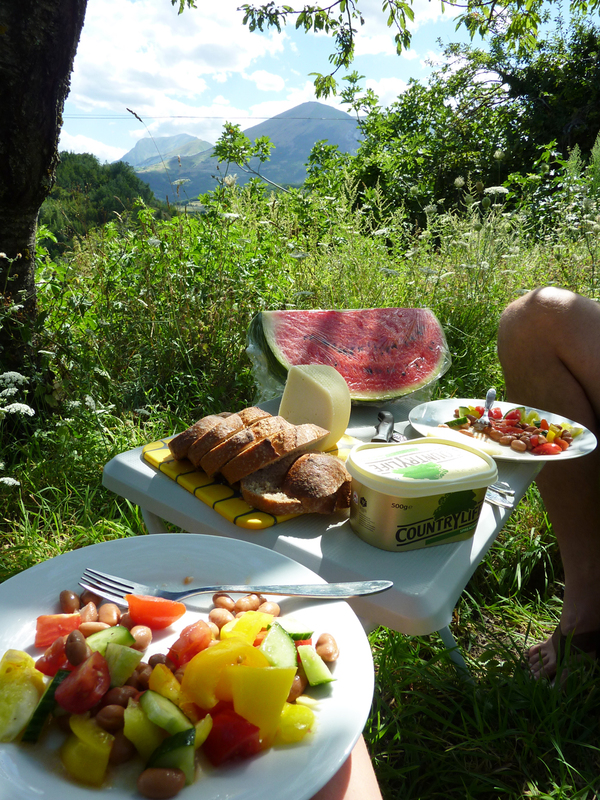 here's a photo of the very colourful lunch we just ate, looking out from the edge of the garden into the Sibillinis. I swear this is the only food photo I've ever taken! Happy Summertime, all!